Some people say butterscotch and caramel are exactly the same, while others say they are completely different in composition and taste. Although it can be difficult to tell them apart (especially if you are just looking at a picture), butterscotch and caramel are actually two different confectionery products. Butterscotch is made by slowly melting brown sugar and butter together over heat. The combination is then brought to a boil and then cooked to a “soft crack” stage using a candy thermometer. If a candy thermometer is not available, the mixture is heated until it is slightly thickened. Naturally, butterscotch tastes like melted butter and sugar. Other ingredients such as cream, corn syrup, molasses, vanilla, and salt may be added to the mixture to make it chewy or to improve its flavor. Butterscotch is perfect for sundae toppings, pudding, biscuits, cookies, and dessert sauce. Butterscotch can be made at home and can be bought from grocery stores. Commercially sold butterscotch can be in a form of chips or disks (similar to chocolate chips), sauce (a thick, opaque liquid), or candies. Additionally, the term “butterscotch” is also used to describe the flavor of melted brown sugar and butter (and not the actual product). For instance, some liqueurs, pastries, and candies are labeled “butterscotch” although they are not made of butter and sugar but contain an artificial butterscotch flavor instead. Contrary to the popular belief, the “scotch” in butterscotch does not refer to the alcoholic drink. There are many theories surrounding the origin of the term “butterscotch” but the most common belief is that “scotch” refers to the method of cutting the candy. Traditionally, butterscotch was produced as a hard candy (similar to toffee). Because it was difficult to cut it into smaller pieces, the candy is “scotched” or “scored” to make it easier to cut. On the other hand, caramel is a made by slowly melting white granulated sugar (in water) over heat (to around 170 °C) until it reaches the “firm ball” stage. Once cooked, the liquid becomes thick and clear. Its color can range from gold to deep brown. Although its primary ingredient is white sugar, brown sugar can also be used. Other ingredients such as cream, water, vanilla, salt, lemon or lime juice, butter, and milk can also be added (especially when making soft caramel) to change its color, texture, and flavor. Some recipes also call for additional ingredients like nuts, liquor, and fruit bits. Caramel can be liquid or solid (chewy or hard). It is perfect for puddings, bonbons, ice cream topping, custard topping, caramel apples, and other desserts such as pralines and crème brûlée. It can be made at home or it can be bought at supermarkets. 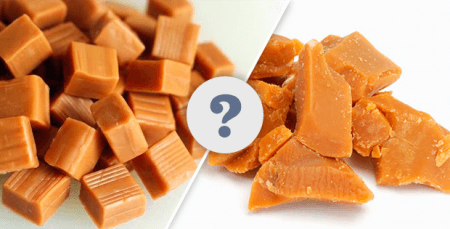 What, then, is the difference between butterscotch and caramel? The main difference between the two is that butterscotch is a mixture of brown sugar and butter cooked to a “soft crack” stage whereas caramel is a melted white granulated sugar cooked to a “firm ball” stage. Both products can be in solid (hard candy) or liquid form (sauce). In its liquid form, caramel is usually translucent, thick, and golden or brown (unless it is mixed with other ingredients), unlike butterscotch which is opaque.